In the current study, the carotenoid pigment was extracted from the corolla of Cucurbita moschata as food colourant with antioxidant property using acetone and hexane. The pure carotenoid was separated by giving water, brine and solvent wash. These carotenoid extract were further used for the TLC analysis. The carotenoid extract was compared with the β- carotene standard and resulted with the two spots. The Rf value was 0.786 (dark orange) and 0.12 (light yellow). Antioxidant assay using TLC was done using DPPH method. Yellow and white band formation confirms that the carotenoid extract having antioxidant. The absorbance was scanned for the carotenoid extract using UV/VIS spectrophotometer and was found to have four compounds at 662.5, 613.0, 497.0, and 436.5 nm. Carotenoid test was carried out for the respective sample. Acetone disappearance confirms that the sample contain carotenoids. Two antioxidant activities were determined for the carotenoid extract. The Phosphomolybdenum method results with the 75.549% of antioxidant concentration and ferric ion reducing antioxidant power assay (FRAP) reveals with the 2.916% of antioxidant concentration. The carotenoid pigment not only plays a role in pharmaceutical, but also in neutraceutical applications. Thus the carotenoid content with antioxidant was detected by UV/VIS spectrophotometer and the compound was separated by column chromatography as food colourant. Carotenoids are red, yellow and orange pigments that are widely distributed in nature. They are especially abundant in yellow-orange fruits and vegetables and dark green, leafy vegetables . Carotenoids have an immense value for human health, and many people are seeking ways to incorporate these health-brimming compounds into their diet . Nutritionists, physicians, and health organizations all recommend a diet high in antioxidants, including those that are derived from carotenoids. The most pronounced benefits of carotenoids are supports eye health, cardiovascular health, possible anti-tumor properties, male fertility, and skin health . Cucurbita moschata is a species originating in either Central America or northern South America. But, carotenoid content was identified different in pumpkin from localities in Malaysia. Carotenoid content in fruits and vegetables varies due to certain factors such as variety, level of maturity, climate or geographic site of production, part of the plant utilized, environment conditions during agricultural production, post-harvest handling, processing, and storage conditions . The pumpkins showed a large variability in the contents of total carotenoids varying, in fresh pumpkins from samples cooked in boiling water and steamed cooked . Pumpkins were grown in the experimental field of Warsaw Agricultural University and determined the dry matter, soluble solids content, total carotenoids content, nitrates content, colour of flesh, antioxidant activity with DPPH method. Significant relationship between carotenoids content and antioxidant activity of pumpkin fruits was found . Carotenoid pigments provide orange colors and antioxidant protection to a wide variety of plants, animals, bacteria, and fungi. They also serve as precursors to other biologically important compounds . Oxidative stress is an important contributor to the risk of chronic diseases. Dietary guidelines recommend increased consumption of fruits and vegetables to combat the incidence of human diseases . Crookneck pumpkin known as Cucurbita moschata is known as Parangi in Tamil, where its flower was used for the project. The flowers were purchased from the local markets of Malaysia. The corolla was removed from the flowers and shadow dried. The dried corolla was powdered by the blender. The powdered sample was weighed using weighing balance and used for further studies. The powdered sample of Cucurbita moschata corolla (2 g) was taken and grinded well using mortar and pestle. Solvent namely acetone and hexane of equal proportion was added to extract the pigment from the sample. Then magnesium sulphate was added to remove the moisture content. The extract was filtered using anhydrous sodium sulphate (to remove the water content from the extract). To extract of carotenoid, the sample extract was given a water wash in the separating funnel. Two phases namely the upper phase (carotenoid) and the lower phase (water) were formed. The water phase was discarded. The brine wash was given. The lower phase was discarded. Solvent of acetone and hexane was washed to the sample to get a pure carotenoid extract, which was stored in dark place. Using rotary evaporator the pure carotenoids was dehydrated and powered. TLC silica gel plates of 60 F254Aluminium sheets (20 x 20 cm) were used for screening the carotenoid. Petroleum ether and acetone (9:1) was used as mobile phase. A space of 1 cm between each spotted sample was retained to spot the sample. Betacarotene as a standard and pure extract of carotenoid from the Cucurbita moschata corolla was allowed to run. Then TLC plate was viewed under UV chamber. Rf value was calculated with the help of fluorescent spots, which was marked. Carotenoids in TLC plate were determined by spraying spots with a DPPH (diphenylpycryhydrazyl) ethanol solution for derivatization. Spots sprayed with the DPPH were observed for white to yellow bands on a purple background. Absorbance of carotenoid was scanned by UV-VIS Spectroscopy using acetone and hexane as a blank and sample were recorded over the wavelength range of 300 to 700 nm using quartz cuvettes with 1 cm diameters. The colour of a solution of the sample in acetone disappears after addition of a 5% solution of sodium nitrite and 0.5 M of sulphuric acid. To a series of fresh tubes respective volumes of ascorbic acid standard and sample was added. The volume was made up to 1 ml with distilled water. Reagent solution of 3 ml was added to the entire test tubes and vortexed well. The test tubes were incubated at 90°C for 90 minutes. After cooling the tubes, the absorbance was read at 695 nm. A standard graph equivalent of ascorbic acid was determined to the antioxidant concentration of sample. To the test tubes, individual volume of standard and sample was added. Phosphate buffer (0.2 M) of 2.5 ml of volume was made to the respective test tubes. Potassium ferric cyanide (1%) of 2.5 ml was added to all the tubes and vortexed well. The test tubes were incubated at 50°C in water bath for 20 minutes. The tubes were cooled and trichloroacetic acid (10%) of 2.5 ml was added. The tubes were vortexed well and 2.5 ml of distilled water was added. Ferric chloride (0.1%) of 0.5 ml was added to all the tubes and vortexed. The tubes were incubated in room temperature for 10 minutes. The absorbance was read at 700 nm. The ornamental plants usually used to decorate the house as well as the environmental surroundings. Some people decorate flowers at the winter season in front of their house or at the auspicious day. These flowers, as soon as dried, were thrown as waste. Without the knowledge of ours, these types of flowers aid in health benefits as well as play a pertinent role in pharmaceutical applications. However, to the best of our knowledge, no single report is accessible in the global level, relating carotenoid extraction from the corolla of Cucurbita moschata. In the previous study, the carotenoids were extracted from the flowers, leaves, fruits, vegetables [8,9]. the present study, the carotenoids were extracted from the corolla of Cucurbita moschata using different solvents namely acetone and hexane in equal proportion (Figures 1-4). Finally the pure carotenoid extract was separated by giving water, brine and solvent wash. Thus the pure carotenoid extract was used for further experiments . 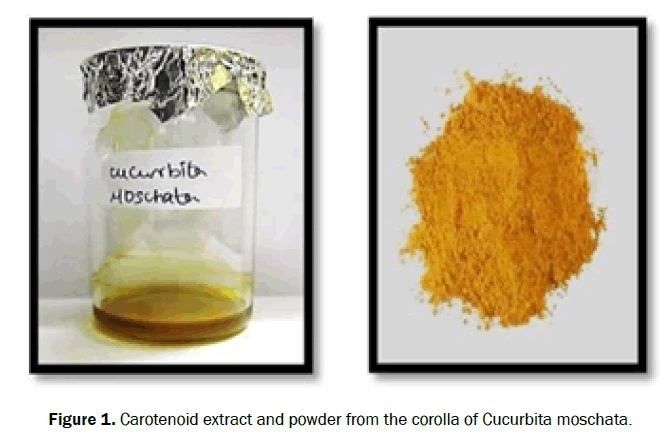 Figure 1: Carotenoid extract and powder from the corolla of Cucurbita moschata. 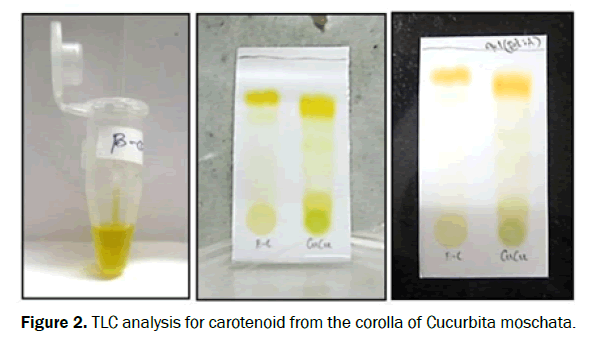 Figure 2: TLC analysis for carotenoid from the corolla of Cucurbita moschata. 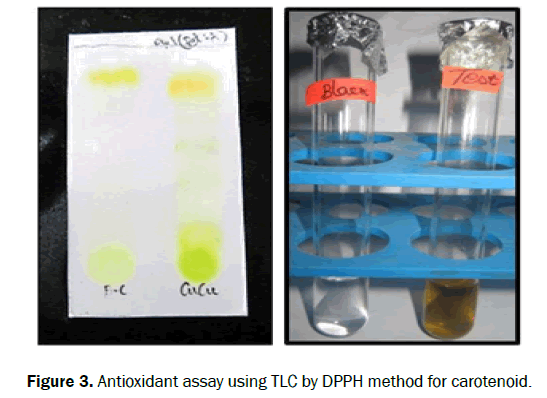 Figure 3: Antioxidant assay using TLC by DPPH method for carotenoid. Figure 4: Antioxidant activity of carotenoid by phosphomolybdenum method and FRAP-ferric ion reducing power method. Screening of TLC was done for the carotenoid extract using mobile phase of petroleum ether and acetone (7:3). The carotenoid extract was compared to the standard of β-carotene. Two spots were found (Dark orange and light yellow). Antioxidant assay was found by dipping TLC in DPPH with ethanol . The carotenoid extract, results with yellow and white band formation in a purple colour background. The absorbance was scanned for the carotenoid extract, which was found to have four compounds at 662.5, 613.0, 497.0, and 436.5 nm. Qualitative analysis was found for the carotenoid extract. Acetone disappearance in the sample was confirmed for its carotenoid test. Antioxidant activity was done for the carotenoid extract . The corolla of Cucurbita moschata results with the 75.549% of antioxidant concentration by the phosphomolybdenum method and 2.916% of antioxidant concentration by ferric ion reducing antioxidant power assay (FRAP) (Tables 1-3). Table 2. OD values for the carotenoid extract from the corolla of Cucurbita moschata. Evaluation of carotenoid extract from the corolla of Cucurbita moschata by total antioxidant capacity (TAC) phosphomolybdenum method using UV/vis spectrophotometer. Table 3. OD values for the standard and the sample. Estimation of antioxidants from the carotenoid extract of Cucurbita moschata corolla by FRAP-ferric ion reducing antioxidant power assay. β-carotene is used as standard and carotenoid extract as sample. Spots sprayed with the DPPH were observed for white to yellow bands on a purple background shows antioxidant presence of carotenoids. The carotenoid extract from the corolla of Cucurbita moschata results with the 75.549% of antioxidant concentration by the Phosphomolybdenum method. The carotenoid extract from the corolla of Cucurbita moschata results with the 2.916% of antioxidant concentration by FRAP-Ferric ion Reducing Antioxidant Power assay. The Cucurbita moschata flower acts as antioxidants which has the capacity to scavenge the free radicals. The carotenoid extracted from the corolla of Cucurbita moschata can also be used as a dye in fabrics and cosmetics etc. The carotenoids are the bioactive compounds, which yields medicinal values like preventing eye diseases, skin health, cardiovascular health, male fertility as well as antioxidants. Thus the carotenoid pigment not only plays a role in pharmaceutical, but also in neutraceutical applications. Bauernfeind JC. Natural food colors. In: Bauernfeind JC (ed.). Carotenoids as Colorants and Vitamin A Precursors. Academic Press, New York. 1981:1-45. Antolovich M, et al. Methods for testing antioxidant activity. The Anlyst. 2002;127:183-198. Demmig-Adams B and Adams WW. Antioxidantsinphotosynthesisandhumannutrition. Sci 2002;298:2149-2153. NorshazilaS, et al. Scheme of obtaining β-carotene standard from pumpkin (Cucurbitamoschata) flesh. IntFood Res J.2012;19:531-535. Lucia MJC, et al. Total carotenoid content,α-carotene and β-carotene, of landrace pumpkins (Cucurbita moschataDuch): A preliminary study. Food Res Int. 2012;47:337-34. Gajewski M, et al. Quality of pumpkin cultivars in relation to sensory characteristics. Not Bot HortAgrobotCluj. 2008;36:73-79. Giuliano G, et al. Carotenoid oxygenases: Cleave it or leave it. Trends Plant Sci.2003;8:145-149. Rao AV and Rao LG. Carotenoids and human health. Pharmacologicl Res.2007;55:207-216. Omayma AE and Abdel Nasser BS. Carotenoids. J Pharmacognosy and Phytochemty. 2013;2:225-233. Sidney P, et al.Microscale extraction method for HPLC carotenoid analysis in vegetable matrices.SciAgric.2014;71:345-355. Wilhelm S and Helmut S. Antioxidant activity of carotenoids. Moleclr Aspect of Medic.2003;24:345–351. Sadineni V, et al. Carotenoid composition of mango (mangiferaindica L.) wine and its antioxidant activity. J Food Biochem.2011;35:1538-1547.